The LaConner Quilt Museum in LaConner Washington hosted a challenge to create a quilt based on one of Rebecca Barker's Quiltscapes notecards (www.quiltscapes.com). Since I knew I was moving to New England, I selected Vermont Maple Leaf. The only instructions were to create a quilt, any style, any size, that showed it took its inspiration from her notecards. 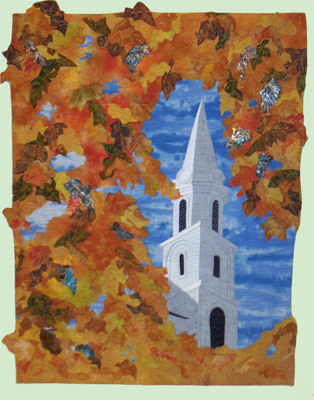 This church in this quilt is the Chestnut Street Baptist Church here in Camden, Maine, and is next to the village green. Every year at Christmas they have a wonderful "Visit Bethlehem" program, where various rooms of the church are set up as steps along the journey to Christ's birth, but my favorite is the marketplace which has tinsmiths, fabric vendors, herb sellers and more. It is a wonderful experience! This quilt features my hand-dyed fabrics for the sky and leaf canopy, as well as patinaed copper sheeting for some leaves. The aged copper is sealed to prevent discoloration of the fabric. Size: 28 by 38 inches. Exhibited at the LaConner Quilt Museum, May 18 to July 17, 2005, and Lowell (Mass.) Quilt Festival, 2006. Available for sale in December 2017.